Juma the Giraffe is a wonderful stand-alone children's book. We offer these additional teaching resources free to use to help guide discussion about the story and educate children and adults about giraffes. After reading the Juma the Giraffe book, start a discussion of the story by asking participants to describe Juma and his friends. What are the giraffe's different personalities? How were the different giraffes also similar? They all have long necks and legs, and they all have spots on their fur. Guide the discussion to how people are alike and how are they different from each other. On the outside, for example, people have two eyes, one nose, two ears, one mouth, two arms, walk on two legs, etc, but people also have different colored eyes and hair and skin. Some people are tall and some are short, etc. On the inside, some people like to tell jokes and some people are shy and quiet, some people like to travel and some like to stay at home, but we are all special because we are all unique and beautiful human beings. Place a 6-foot long paper from a roll on the ground or a long table and draw the silhouette of a giraffe (best if drawn in advance). This is the size of a baby giraffe when it is born! During the lesson, have each participant draw and color a spot on the giraffe, until the giraffe is filled up with its own unique pattern. Alternatively, use color-safe, non-toxic paint and have each child put their own hand print as a spot inside the giraffe, or have each child trace their own hand print and decorate it. There could be a discussion of how each participant’s hand print is a unique spot contributing to the overall beauty of the giraffe that is created. Giraffe are amazing animals. 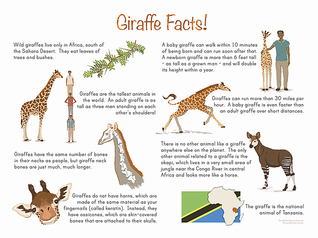 Here is a poster to download and print for your classroom or child's room to teach them some interesting facts about giraffes. 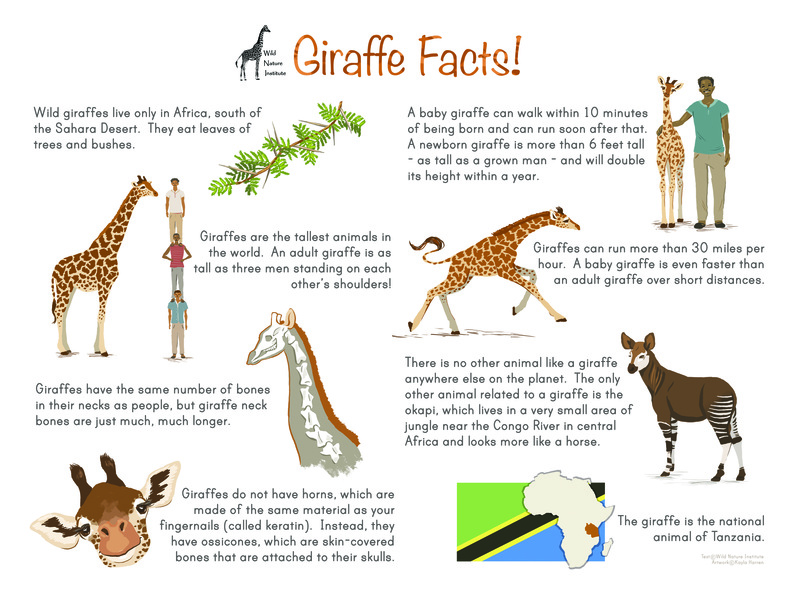 These are the same facts presented on our Giraffe Facts webpage and on the back pages of the Juma the Giraffe book. The patterns on a giraffe's fur are unique to that individual—no other giraffe in the world has the same pattern, and the pattern does not change during its lifetime. Scientists use these patterns to identify each giraffe in a population and study them over long time periods. A computer program helps wildlife biologists who study giraffes to match the patterns from photographs taken in the field. This way the scientists can keep track of hundreds and even thousands of giraffes. 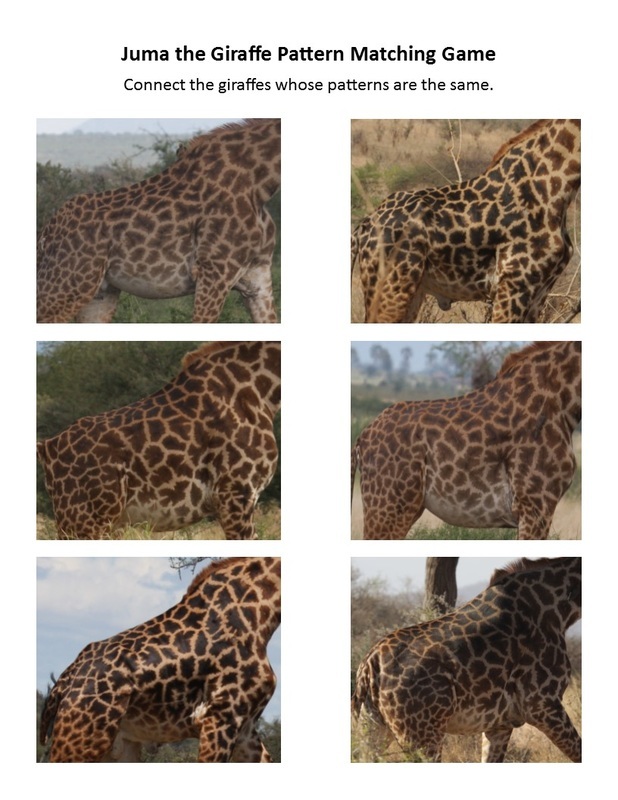 This activity challenges advanced and older students to match real giraffe photographs in the left column with the same giraffe in the right column. Participants will be able to list or show in pictures characteristics common to all giraffes, and characteristics that make individual giraffes unique from each other. Participants will also be able to identify and discuss ways in which people are alike and different (both on the outside and inside). 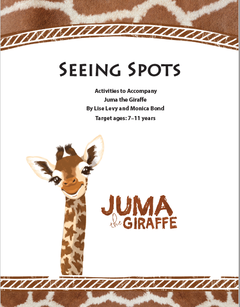 Given pictures of the four different giraffe coat patterns from the Juma book, participants will be able to identify the giraffes by making drawings of unique spots or patterns to record each giraffe’s individual coat characteristics. Using the records made of each giraffe’s unique spot/coat patterns, participants will be able to predict a giraffe’s identity by visually and/or physically matching spots or group of spots to the specific coat pattern of an unidentified individual giraffe. Participants will create a mural of a unique giraffe by collectively contributing individually made spots to a giraffe silhouette, thereby illustrating the unique quality of giraffe coat patterns. Participants will create a simple giraffe mask with their own unique spot pattern. After an explanation of WildID the older participants will be able to discriminate individual giraffes by identifying the unique spot/coat patterns in various torso pictures of real giraffes taken in the field. Identify the unique characteristics of giraffes and the significance of these characteristics. Identify and explain the various elements of the story in a discussion based on a set of reading comprehension questions designed to develop the characterization, setting, and plot with the chronology of events. Produce a story board or timeline for the book using the specific elements identified in the comprehension discussion. Rewrite and develop the Juma story into a play script using story board or timeline produced. Design and create simple costuming for each of the characters in the play that exemplifies both similarities and differences in the giraffes based on their identifying features as described in the book. Identify the cultural significance of animal masks and its possible connection to conservation awareness after research of the art of African mask making. Set up and dramatize the simple play created about Juma using script, costumes, and appropriate props. Discriminate individual giraffes by identifying the unique spot/coat patterns in various torso pictures of real giraffe taken in the field with an explanation of the WildID computer program that matches patterns. Illustrate the unique quality of giraffe coat patterns by collectively contributing individually made spots (or handprints) to a giraffe silhouette, thereby creating a mural of a unique giraffe. Define, give examples of, and identify methods to determine size of populations. Identify the different types of organisms that live in the African savannah biome. 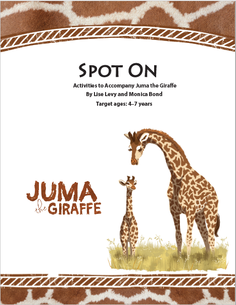 After reading Juma the Giraffe, your child can test his or her knowledge of giraffes with this short, fun quiz of five questions (and answers). Juma author Monica Bond is a wildlife scientist studying giraffe in Tanzania with the Wild Nature Institute. Juma designer and illustrator Kayla Harren is a professional artist who has illustrated more than 20 children’s books. Visit www.kaylaharren.com. Lise Levy developed the Juma lesson plans. Lise is a retired biology and environmental science teacher with more than 32 years of experience and has won numerous awards for outstanding science teaching. The Wild Nature Institute thanks these organizations that supported the Juma Project for giraffe conservation and community education in Tanzania.